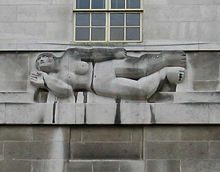 Reclining Figure (1951) outside the Fitzwilliam Museum, Cambridge, is characteristic of Moore's sculptures, with an abstract female figure intercut with voids. There are several bronze versions of this sculpture, but this one is made from painted plaster. Sir Henry Spencer Moore OM CH FBA, (July 30, 1898 – August 31, 1986) was a British artist and sculptor. The son of a mining engineer, born in the Yorkshire town of Castleford, Moore became well known for his larger-scale abstract cast bronze and carved marble sculpture. Substantially supported by the British art establishment, Moore helped to introduce a particular form of modernism into the United Kingdom. His forms are usually abstractions of the human figure, typically depicting mother-and-child or reclining female figures. These sculptures feature "piercings" or hollow spaces which emphasize the convex and concave aspects of the body, at the same time revealing the unique beauty of the human form. Moore's ability to satisfy large-scale commissions made him exceptionally wealthy towards the end of his life. However, he lived frugally and most of his wealth went to endow the Henry Moore Foundation, which continues to support education and promotion of the arts. 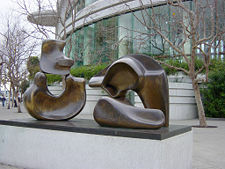 Three Piece Reclining Figure Draped (1976), Massachusetts Institute of Technology. 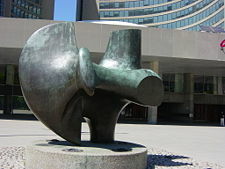 Moore is best known for his abstract monumental bronzes which can be seen in many places around the world as public works of art. The subjects are usually abstractions of the human figure, typically mother-and-child or reclining figures. Apart from a flirtation with family groups in the 1950s, the subject is nearly always a woman. Characteristically, Moore's figures are pierced, or contain hollow places. Many interpret the undulating form of his reclining figures as references to the landscape and hills of Yorkshire where Moore was born. 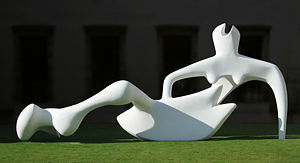 Moore's signature form is a pierced reclining figure, first influenced by a Toltec-Maya sculpture known as "Chac Mool," which he had seen as a plaster cast in Paris in 1925. Early versions are pierced conventionally as a bent arm reconnects with the body. Later more abstract versions are pierced directly through the body in order to explore the concave and convex shapes. These more extreme piercings developed in parallel with Barbara Hepworth's sculptures. Moore's early work focused on direct carving in which the form of the sculpture evolves as the artist repeatedly whittles away at the block (see Half-figure, 1932. In the 1930s, Moore's transition into Modernism paralleled that of Barbara Hepworth with both sculptors bouncing new ideas off each other and several other artists living in Hampstead at the time. Hepworth first pierced a torso after misreading a review of one of Henry Moore's early shows. Moore made many preparatory sketches and drawings for each sculpture. Most of these sketchbooks have survived, providing an insight into his development. By the end of the 1940s, Moore increasingly produced sculptures by modeling, working out the shape in clay or plaster before casting the final work in bronze using the lost wax technique. After the Second World War Moore's Bronzes took on their larger scale, particularly suited for the public art commissions he was receiving. As a matter of practicality he largely abandoned direct carving, and took on several assistants to help produce the maquettes. At his home in Much Hadham, Moore built up a collection of natural objects; skulls, driftwood, pebbles and shells, which he would use to provide inspiration for organic forms. For his largest works, he often produced a half-scale, working model before scaling up for the final molding and casting at a bronze foundry. Moore often refined the final full plaster shape and added surface marks before casting. Three Way Piece No. 2 (The Archer) (1964-65) bronze, Nathan Phillips Square, Toronto. Moore was born in Castleford, West Yorkshire, England, the seventh of eight children to Raymond Spencer Moore and Mary Baker. His father was a mining engineer who rose to be under-manager of the Wheldale colliery in Castleford. He was an autodidact with an interest in music and literature, and he saw formal education as the route to advancement for his children, determined that his sons would not work down the mine. Moore attended infant and elementary schools in Castleford, and began modeling in clay and carving in wood. He decided to become a sculptor when he was only eleven, after hearing of Michelangelo's achievements. When he was twelve he won a scholarship to attend Castleford Secondary School, as several of his brothers and sisters had done. There, his art teacher introduced him to wider aspects of art, and with her encouragement he was determined to make art his career and sit examinations for a scholarship to the local art college. Despite his showing early promise, Moore's parents were against him training as a sculptor which they saw as manual labor without much prospect of a career. Instead, after a brief introduction as a student teacher, he became a teacher at the school he had attended. On turning 18 in 1917, at the height of World War I, Moore was called up into the army. The youngest man in his regiment, the Prince of Wales's Own Civil Service Rifles, he was injured in a gas attack during the Battle of Cambrai. After recovering in hospital, he saw out the remainder of the war as a physical training instructor. In stark contrast to many of his contemporaries, Moore's wartime experience was largely untroubled. He said later, "for me the war passed in a romantic haze of trying to be a hero." After the war, Moore received an ex-serviceman's grant to continue his education and became the first student of sculpture at Leeds School of Art in 1919 — the school had to set up a sculpture studio especially for him. While at Leeds, Moore met fellow art student Barbara Hepworth, beginning a friendship which would last for many years. Moore was also fortunate to be introduced to African tribal sculpture, by Sir Michael Sadler, the Vice-Chancellor at the Leeds School. In 1921 Moore won a scholarship to study at the Royal College of Art (RCA) in London, where Hepworth had gone the year before. While in London, Moore extended his knowledge of primitive art and sculpture, studying the ethnographic collections at the Victoria and Albert Museum and the British Museum. Both Moore and Hepworth's earliest sculptures followed standard teaching in romantic Victorian style; subjects were natural forms, landscapes and figurative modeling of animals. Moore increasingly felt uncomfortable with these classically derived ideas. With his knowledge of primitivism and the influence of sculptors such as Brancusi, Epstein and Dobson he started to develop a style of direct carving in which imperfections in the material and tool marks are incorporated into the finished sculpture. In doing so he had to fight against his academic tutors who did not appreciate the modern approach. In one exercise set by Derwent Wood, the professor of Sculpture at the RCA, Moore was supposed to reproduce a marble relief of Rosselli's The Virgin and Child, by first modeling the relief in plaster then reproducing it in marble using the mechanical technique of 'pointing'. Instead, Moore carved the relief directly, even marking the surface to simulate the surface prick marks that would have been left by the pointing machine. Nevertheless, in 1924, Moore won a six-month traveling scholarship which he spent in Northern Italy studying the great works of Michelangelo, Giotto and several other Old Masters. Since Moore had already started to break away from the classical tradition, it is not clear that he drew much influence from this trip, though in later life he would often claim Michelangelo as an influence. Moore's first public commission, West Wind (1928-1929) was one of the eight 'winds' reliefs high on the walls of London Underground's headquarters at 55 Broadway. The other 'winds' were carved by contemporary sculptors including Eric Gill. On returning to London, Moore began a seven-year teaching post at the RCA. He was only required to teach two days a week, which gave him plenty of time to spend on his own work. In July 1929, he married Irina Radetsky, a painting student at the RCA — Irina was born in Kiev on March 26, 1907 to Russian-Polish parents. Her father disappeared in the Russian Revolution and her mother was evacuated to Paris where she married a British army officer. Irina was smuggled to Paris a year later and went to school there until she was 16, after which she was sent to live with her stepfather’s relatives in Buckinghamshire. With such a troubled childhood, it is not surprising that Irina had a reputation of being quiet and a little withdrawn. However, she found security in her marriage to Moore and was soon posing for him. Shortly after getting married the pair moved to a studio in Hampstead on Parkhill Road, joining a small colony of avant-garde artists who were starting to take root there. Shortly afterwards, Hepworth and her partner Ben Nicholson moved into a studio around the corner from Moore, while Naum Gabo, Roland Penrose and the art critic Herbert Read also lived in the area. This led to a rapid cross-fertilization of ideas that Read would publicize, helping to raise Moore's public profile. The area was also a stopping-off point for a large number of refugee architects and designers from continental Europe enroute to America many of whom would later commission works from Moore. In the early 1930s, Moore took up a post as the Head of the Department of Sculpture at the Chelsea School of Art. Artistically, Moore, Hepworth and other members of the 7 and 5 Society would develop steadily more abstract work, partly influenced by their frequent trips to Paris and contact with leading progressive artists, notably Picasso, Braque, Arp and Giacometti. Moore flirted with Surrealism, joining Paul Nash's Unit One Group in 1933. Both Moore and Paul Nash were on the organizing committee of the London International Surrealist Exhibition, which took place in 1936. 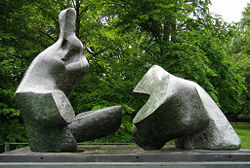 In 1937 Roland Penrose purchased an abstract 'Mother and Child' in stone from Moore that he displayed in the front garden of his house in Hampstead. The piece proved controversial with other residents and a campaign was run against the piece by the local press over the next two years. At this time Moore gradually transitioned from direct carving to casting in bronze, modelling preliminary maquettes in clay or plaster. Two Piece Reclining Figure No. 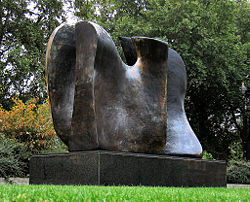 5, Bronze (1963–1964), in the grounds of Kenwood House, London. This inventive and productive period was brought to an end by the outbreak of the Second World War. The Chelsea School of Art evacuated to Northampton and Moore resigned his teaching post. During the war, Moore was commissioned as a war artist, notably producing powerful drawings of Londoners sleeping in the London Underground while sheltering from the blitz. These drawings helped to boost Moore's international reputation, particularly in America. After their Hampstead home was hit by bomb shrapnel in 1940, he and Irina moved out of London to live in a farmhouse called Hoglands in the hamlet of Perry Green near Much Hadham, Hertfordshire. This was to become Moore's final home and workshop. Despite acquiring significant wealth later in life, Moore never felt the need to move to a larger home and apart from adding a number of outbuildings and workshops the house changed little. After the war and following several earlier miscarriages, Irina gave birth to their daughter, Mary Moore on March 7, 1946. The child was named after Moore's mother, who had died a couple of years earlier. Both the loss of his mother and the arrival of a baby focused Moore's mind on the family, which he expressed in his work by producing many "mother-and-child" compositions, although "reclining figures" also remained popular. In the same year, Moore made his first visit to America when a retrospective exhibition of his work opened at the Museum of Modern Art in New York. Kenneth Clark became an unlikely but influential champion of Moore's work and through his position as member of the Arts Council of Great Britain secured exhibitions and commissions for the artist. In 1948 he won the International Sculpture Prize at the Venice Biennale and was one of the featured artists of the Festival of Britain in 1951 and Documenta 1 in 1955. 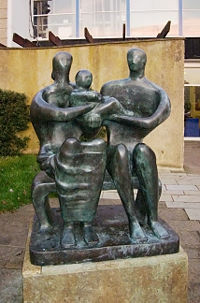 Family Group (1950) bronze, outside Barclay School in Stevenage, was Moore's first large scale commission following the Second World War. Towards the end of the war, Moore had been approached by Henry Morris who was in the process of trying to reform education with the concept of the Village College. Morris had engaged Walter Gropius as the architect for his second village college at Impington near Cambridge and he wanted Moore to design a major public sculpture for the site. Unfortunately, the County Council could not afford Gropius's full design, and scaled back the project when Gropius emigrated to America. Lacking funds, Morris had to cancel Moore's sculpture, which had not progressed beyond the maquette stage. Fortunately, Moore was able to reuse the design in 1950 for a similar commission outside a secondary school for the new town of Stevenage. This time, the project was completed and Family Group became Moore's first large scale public bronze. In the 1950s, Moore began to receive increasingly significant commissions, including one for the UNESCO building in Paris 1957. With many more public works of art, the scale of Moore's sculptures grew significantly and he started to employ a number of assistants to work with him at Much Hadham, including Anthony Caro and Richard Wentworth. On the campus of the University of Chicago, twenty-five years to the minute (3:36 p.m., December 2, 1967) after the team of physicists led by Enrico Fermi achieved the first controlled, self-sustaining nuclear chain reaction, Moore's Nuclear Energy was unveiled on the site of what used to be the University's football field bleachers, in the squash courts beneath which the experiments had taken place. 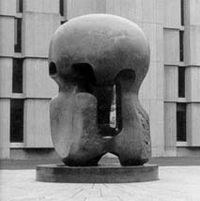 This twelve-foot-tall piece in the middle of a large, open plaza is often thought to represent a mushroom cloud topped by a massive human skull, but Moore's interpretation was very different. He once told a friend that he hoped viewers would "go around it, looking out through the open spaces, and that they may have a feeling of being in a cathedral." Knife Edge – Two Piece (1962) bronze, sited opposite the Houses of Parliament, Westminster, London. The last three decades of Moore's life continued in a similar vein, with several major retrospectives around the world, notably a very prominent exhibition in the summer of 1972 in the grounds of the Forte di Belvedere overlooking Florence. By the end of the 1970s, there were some 40 exhibitions a year featuring his work. When I was offered the site near the House of Lords… I liked the place so much that I didn't bother to go and see an alternative site in Hyde Park — one lonely sculpture can be lost in a large park. The House of Lords site is quite different. It is next to a path where people walk and it has a few seats where they can sit and contemplate it. Hill Arches (1972-1973) bronze, at the National Gallery of Australia. As his personal wealth grew dramatically, Moore began to worry about his legacy. With the help of his daughter Mary, he set up the Henry Moore Trust in 1972, with a view to protecting his estate from death duties. By 1977 he was paying about a million pounds a year in income tax, and so to mitigate this tax burden he established the Henry Moore Foundation as a registered charity with Irina and Mary as trustees. Although Moore had turned down a knighthood in 1951 he was later awarded the Companion of Honour in 1955 and the Order of Merit in 1963. He was a trustee of both the National Gallery and Tate Gallery. His proposal that a wing of the latter should be devoted to his sculptures aroused hostility among some artists. 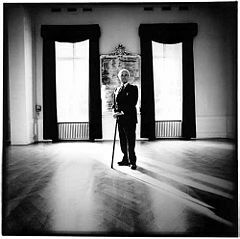 In 1975 he became the first President of the Turner Society, which had been founded to campaign for a separate museum in which the whole Turner Bequest might be reunited, an aim defeated by the National Gallery and Tate Gallery. 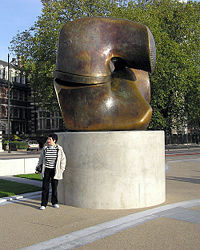 Henry Moore died on August 31, 1986, at the age of 88, in his home in Hertfordshire. His body is interred in the Artist's Corner at Saint Paul's Cathedral. Most sculptors who emerged during the height of Moore's fame, and in the aftermath of his death, found themselves cast in his shadow. 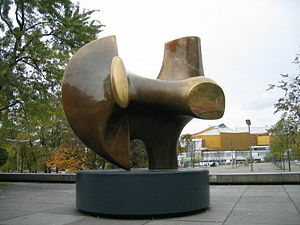 By the late 1940s, Moore was a worldwide celebrity; he was the voice of British sculpture, and of British modernism in general. The next generation was constantly compared against him, and reacted by challenging his legacy, his "establishment" credentials and his position. At the 1952 Venice Biennale, eight new British sculptors produced their Geometry of Fear works as a direct contrast to the ideals behind Moore's idea of Endurance, Continuity. Popular interest in Moore's work was perceived by some to have declined in the UK following his death, but has been revived by exhibitions including Henry Moore at Tate Britain in 2010 and Moore at Kew and Hatfield in 2007 and 2011 respectively. Yet Moore had a direct influence on several generations of sculptors of both British and international reputation. Among the artists who have acknowledged Moore's importance to their work are Sir Anthony Caro who worked as Moore's assistant in the 1950s, his student Phillip King, and Isaac Witkin, who apprenticed with Moore in the 1960s. His work, however, has frequently been subject to vandalism. His King and Queen (1952-1953) were decapitated in Dumfries in 1995 and daubed with blue paint in Leeds. His Recumbent Figure had her head chopped off on a wartime loan to the Museum of Modern Art in New York, his Spindle Piece (1968-69) was vandalized with metal chains in Houston, and his Draped Seated Woman (1957-58) ended up tarred and feathered in the Ruhr. Today, the Henry Moore Foundation manages the artist's former home at Perry Green in Hertfordshire as a visitor destination, with 70 acres of sculpture grounds as well as his restored house and studios. It also runs the Henry Moore Institute in Leeds which organizes exhibitions and research activities in international sculpture. The Foundation he endowed continues to play an essential role in promoting contemporary art in the United Kingdom and abroad through its grants and exhibitions. Panorama of the Art Gallery of Ontario's Henry Moore collection, the largest public collection of the sculptor's works in the world. 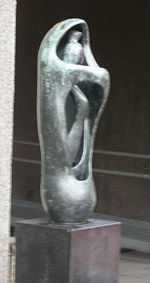 Locking Piece (1963) bronze, presented to the Tate Gallery and now sited in Millbank near the Tate Britain. Sainsbury Centre for Visual Arts, and dotted around the campus of UEA, Norwich, UK. ↑ Elizabeth Day, The Moore legacy The Observer (July 26, 2008). Retrieved September 13, 2012. ↑ Henry Moore, Half-figure 1932 Tate. Retrieved September 13, 2012. ↑ The Manhattan Project, Nuclear Energy, University of Chicago, Department of Physics. Retrieved September 13, 2012. ↑ Andrew Causey, Sculpture Since 1945 (Oxford: Oxford University Press, 1998, ISBN 978-0192842053), 71. ↑ Biography. anthonycaro.org. Retrieved on September 13, 2012. ↑ Marianne MacDonald, Reward offered for Moore statue's heads The Independent (August 1, 1995). Retrieved September 13, 2012. ↑ Hilary Spurling, The turbulent reputation of Henry Moore The Guardian (February 27, 2010). Retrieved September 13, 2012. ↑ The Henry Moore Foundation, About Us. Retrieved on September 13, 2012. McAvera, Brian. "The Enigma of Henry Moore" Sculpture Magazine, 20(6) (July/August 2001). Retrieved September 13, 2012. Henry Moore works to go on display at Tate BBC News. An Intimate Moore By Tom L. Freudenheim, The Wall Street Journal, June 30, 2010. This page was last modified on 18 December 2017, at 16:56.